If you’ve watched the TV show ‘The Simpsons’, you’re probably familiar with Homer Simpson’s constant love affair with doughnuts. And it’s not hard to see why; after all, who can resist a soft, sweet ring into which you can just dig your teeth and forget about everything else in the world? Doughnuts were pretty important during wartime too, which is how a day dedicated to doughnuts came to be – National Doughnut Day! Now, the obvious way to celebrate this special day would be to sit and munch on a chocolate glazed doughnut accompanied by hot coffee, but we have a slightly healthier option; presenting 10 fun doughnut crafts that are (almost) as good as eating doughnuts!! Got some paper plates lying around? 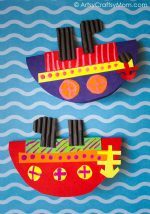 Then don’t look further than this craft from Kidspot! This doughnut garland is perfect for a child’s room or for a doughnut or candy themed birthday party. 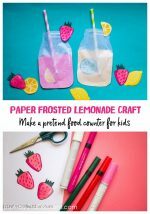 All you need is colored paper and confetti and you can start crafting! A ring toss game is always fun, and is perfect for summer. But when those rings turn into funky looking doughnuts, the game’s fun quotient goes up several notches! 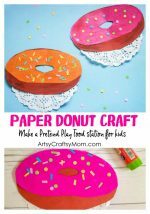 This project on My Fab Land shows you how you can turn simple cardboard rings into fun doughnuts to toss. Now a doughnut garland is all very well, but maybe your child wants something a little less kiddish and a little more utilitarian to decorate her room. In that case, this super-cute doughnut bulletin board from Paint the Gown Red is ideal! We think the use of sprinkle push pins is very clever! These adorable doughnut coasters from Hello Glow are easy to create and make great DIY gifts. If you ask us, they’re perfect for Father’s Day, especially if you have a doughnut-loving Dad! 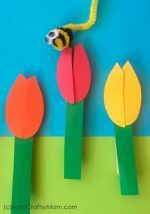 The tutorial is easy, although kids might need help to cut out the hole in the center. If your preschooler is getting frustrated at boring old methods of learning, try printing out this Doughnut game from Glued to My Crafts. The craft is perfect for older siblings to make, and everyone can get together to roll the dice and start counting – who can resist numbers when learning is so much fun! Paper plates are really versatile; I mean who would think of making purses out of them? That’s how creative the folks at Pink Stripey Socks are, and they’ve come up with a seriously ‘dripping-with-cuteness’ doughnut plate purse, complete with frosting and sprinkles! We had Earth Day last month, and we’ve got Environment Day coming up next month, which means that recycling is on everyone’s mind. Make the most of the mood and put those old scratched CDs to good use by making this fun doughnut craft from A Little Pinch of Perfect. The puffy paint gives it a very realistic look! When you’re a doughnut, sitting in a bakery, you tend to resign yourself to the fact that you’ll be picked up one day and put in a paper bag for someone to take away. But not Arnie, who has a mind of his own! Find out how Arnie influences the others and all the adventures he has in this fun series of books. These cards from Damask Love are so easy to make and they look so pretty! You can use them as Valentines, or even invitations to a doughnut party. If you don’t have the fancy circle device shown in the tutorial, you can use a simple compass – the result will be just fine! Can you believe that this doughnut is made from a sock? Yes, it is! Now you don’t need to fret over socks that are mate-less, turn them into doughnuts! 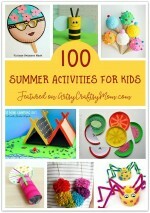 These are easier than they look, even kids can make them! Get the full tutorial at Inner Child Fun. You have enough activities to keep your kids busy this National Doughnut Day, so make sure you have all the supplies ready! And when they tire out from all the crafting, be sure to have some soft doughnuts and chocolate milkshake waiting for them!